So for the holidays I have a few favorite things that I enjoy this time of the year. 1. Seeing all the beautiful window displays at local antique shops. This photo was taken of an antique shop window display in New Albany, IN. My cousin, aunt, mom, and I spent the afternoon shopping at their local boutiques. 2. Vintage ornaments on my little silver tinsel tree. 3. I absolutely love collecting Cody Fosters glittery holiday houses. Each one is so interesting, and tells a story with all its little decorations and details. This pink one happens to be my favorite! 4. I love this ornament because of the color combination of red and turquoise. I love using those two colors together during the holidays. You should try using red and turquoise while wrapping your packages. 5. Making ornaments with my boys is a holiday tradition that I look forward to every year. This year we made these little pine cone elves. Each one is as individual as my boys are. I have the directions on how to make these on the previous blog posts. 6. 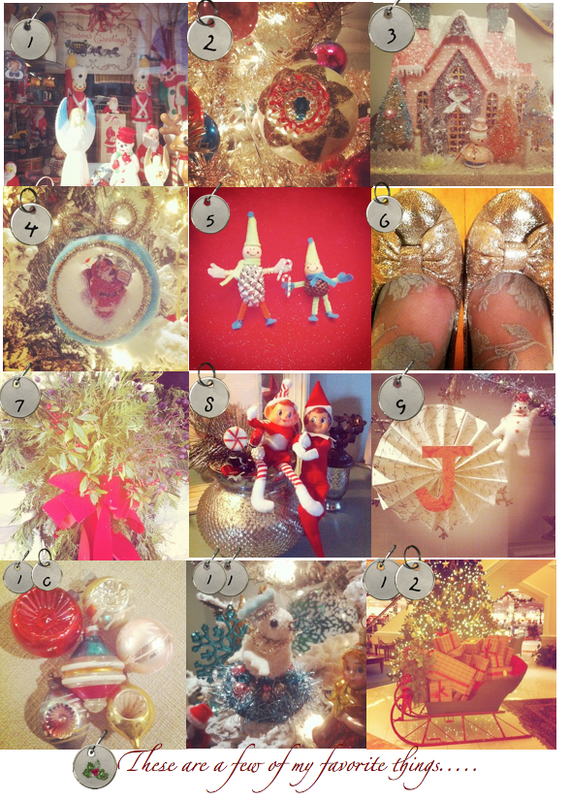 My glittery, sparkly, shoes are a holiday staple! I love wearing them every chance I get during the holidays. 7. Nothing says Christmas more than fresh greenery all around. I love the way it smells and looks. 8. Elf on the Shelf is another holiday tradition that we have at our home. I love to see the look on my boys' faces when they find where the elf is hiding every morning. 9. This is a garland that I made for my mantel this year. The garland reads "JOYFUL", because that is what we should feel this time of the year. I made it with vintage script paper and some scrapbook paper, along with some glittery snowflakes and snowmen. 10. I try to add a few vintage ornaments to my collection each year. It is so fun going out antiquing and finding all these lovely treasures. Each one has such history. 12. And last but not least, I love the way department stores decorate for the holidays. It just makes shopping even more fun. I enjoy hearing the Christmas carols ring through the store, and all the workers seem happy to help. Everything seems more magical when you add Christmas lights to it! I'd love to hear what your favorite things are this holiday season. I took all these photo's using my iPhone, and they were posted to my Instagram account. Instagram is a fun iPhone app, that I highly recommend. If you would like to follow me, I have a link on my blog page(the one with the little camera). Hope you are having a wonderful holiday season!